The fast development of modern science and technology,the basic necessities of our life food,cloth and commodities has changed our daily life. we can use handphone to internet survey, and operation multi-platforms by one key only, even the travel has become a fashion. we have to say, as the society keep progress, more and more high technology emerge as the times , and people become more lazy, no patience, waiting the red and green light, traffic ,all of this has driving people to be crazy, the miserable is meet this two things when you travel. You can browse the internet any time on your big screen phone, pursue and admired by people, because people getting lazy , lazy to communication, lazy go out , even lazy to read a newspaper, people leave computer will eliminate a tons of Internet geek, but the mobile, but the popularized of mobile phone brings too many heads-down tribe. The car convenient people go out, but also bring another problem, for example the air quality problem, such as the transportation, by this item, the car is not the best tool for travel, looking to the future, we need to change and choose a suitable transportation tool. 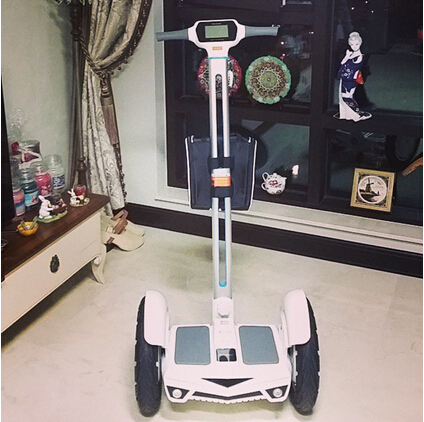 Airwheel new launched self balancing scooter, is basic by aviation attitude principle and fuzzy algorithm and gyroscope R&D intelligence high tech transportation,besides the cool Appearance,still have some unexpected function make people eye-opening. The flickering enviroment light, it remind people prompt functions during night ride. Open mobile phone, via Bluetooth and the aierwei intelligent self balancing car connection, and then through the mobile phone to play music. The speaker of the S3 super bass can bring users super sense, was in large concert. Song playback function like everyone, not only in time to ride is not boring, even when at home can use S3 when the speaker, kill two birds with one stone. Airwheel S3 not sale by outside apperance, whatever for work or school or daily commuter, Airwheel S3 is definitely your best choice, each part of scooter,and each function are is not just a furnishings.